← for the love of pizza. I must say that since jimmy has been a transplant to the south from the west coast, he has definitely become a convert of the ‘”church of BBQ”. One of our favorite BBQ joints is just right down the road from us, Smokey Dembo. The funny thing is they are only open Thursday Saturday so you know they are doing something right with their food if they can afford to stay in business! The guy that owns the place starts smoking his ribs on Tuesday to get ready for Thursday night’s menu! Craziness! Well who has that kind of time these days? I certainly don’t, so I came up with a way to satisfy jimmy’s cravings for BBQ on a weeknight and still get it done in less time. I found a recipe that oven-roasts the ribs and it gives them a really yummy taste, but doesn’t take as long. I have made this recipe 2 different times and the second time it turned out better because I tweaked it to our liking on the spices and of course basted them with our favorite BBQ sauce, Sweet Baby Ray’s. If you haven’t made ribs outside of the standard grilling method, you have to try this recipe! It is so easy and perfect for a mid-week BBQ craving! Empty tea bags into a bowl and combine with brown sugar and other spices to make a rub. Grate in the orange zest and mix well. Pat the ribs dry and trim the membrane from the underside. 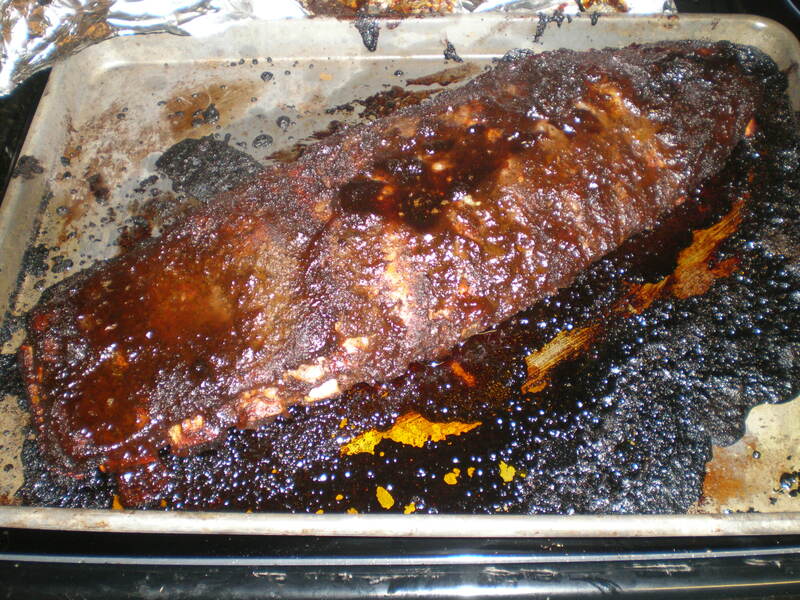 Rub the tea mixture over ribs, making sure to coat every surface. Place them in a roasting pan, meat-side up, and bring to room temperature, about 20 minutes. Meanwhile, preheat oven to 275 degrees. In a small saucepan, combine the juice from the orange and BBQ sauce over low heat. It should thin out the sauce but still make it thick enough for good basting. Pour 1/2 of the mixture over the ribs and cover with foil. Roast until tender, about 1 hr and 30 minutes. Be sure not to check the ribs at any time during this step, keep the oven closed so that they can roast evenly! Boil potatoes in a large pot of salted water, until tender, about 5-7 minutes. Drain and cool slightly. Mix mayo and chives together, and add the zest and juice of 1/2 of the lemon. Combine potatoes with dressing, mixing well. Grate the rest of the lemon zest into bowl, then add parmesan cheese, tossing again to mix. Chill in fridge until ready to serve! Oh my!!! These look delicious!! !